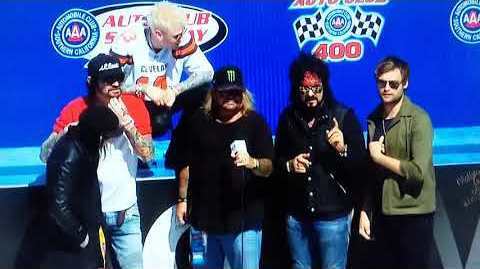 Motley Crue kickstarted the Monster Energy NASCAR Cup Series Auto Club 400 race at Auto Club Speedway in Fontana, CA on Sunday. The band were on hand to act as Grand Marshals for the event, where they were joined by a pair of actors from the group’s upcoming Netflix biopic, “The Dirt” - Douglas Booth (who plays Nikki Sixx) and Colson Baker a.k.a. Machine Gun Kelly (who plays Tommy Lee). Based on Motley Crue’s 2001 memoir of the same name and set to premiere March 22 on the video channel, “The Dirt” is directed by Jeff Tremaine and follows the group’s rise from the Los Angeles club scene to headline-making international stardom.